Autism and the Art of Communication: A day to spoil your moms! A day to spoil your moms! Adam loves his mom. 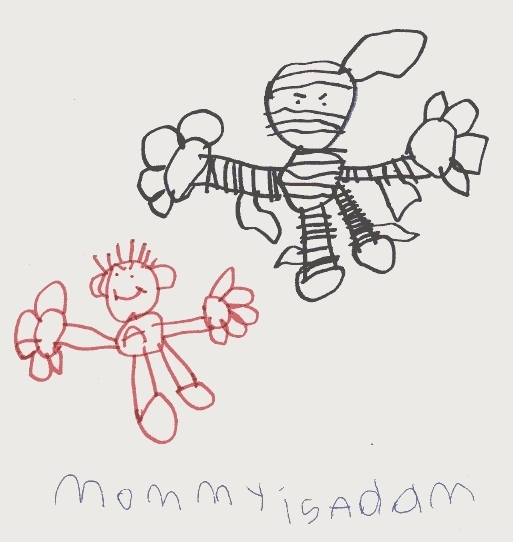 At the time he created this picture, Halloween monsters and creatures were his passion. He draws "mommy" as a "mummy", the highest compliment, and the facial expressions suggest that he and his mom are set for risky (but fun) adventures at a moment's notice. When Adam was small, his mom was not only the center of his world, but the only salient part - the lone voice he recognized and responded to, the single person he actually "knew". As he's grown, his world has expanded to include other people, but she is still the constant (and I would guess still the favourite ... sorry Case!). ... and I hope you get (edible) breakfast in bed!